The Rainbow Babies :: What is Long-Term Care and How Does it Fit into Your LGBT Family? What is Long-Term Care and How Does it Fit into Your LGBT Family? You probably know someone who has needed long-term care. Maybe you have witnessed your partner, friend or colleague struggle with the emotional and financial issues that can come with a long-term care experience. The truth is, no matter when the need arises, because of age, disability, or because of an unexpected illness or accident, long-term care can affect any age group, any social strata, and any geographic location. But what is it and how can you plan for it? Long-term care is help you may need due to a lengthy illness, an unexpected injury or accident, or a severe cognitive disorder such as Alzheimer’s disease. It’s assistance with the everyday tasks, or the activities of daily living (such as bathing, eating, dressing and transferring). Long-term care may be provided in a variety of locations, from nursing homes and assisted living facilities to adult day care centers and even your own home. Most of us strive to live active, healthy lives well into our later years, and indeed as a society, Americans are living longer than ever before. This extended longevity is one of the things that drives the growing need for long-term care – the longer we live, the better the odds that we may need long-term care services. It is predicted that in the year 2020, some 12 million older Americans are expected to need long-term care. 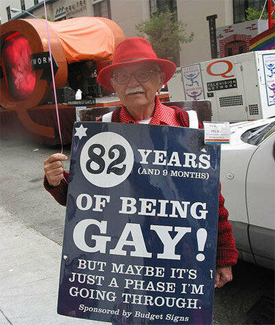 Given the fact that many LGBT persons tend to age alone, long term care is more important than ever before. Long-term care can be expensive, financially and emotionally. An unexpected need for long-term care can have a significant impact on a family’s assets and lifestyle. Close to one-fourth of all nursing home costs are paid out-of pocket by individuals and their families. Many people mistakenly believe that their health insurance will cover the cost of long-term care. Others believe that Medicare or Medicaid will cover long-term care expenses. While Medicare does provide health coverage for seniors, it is limited in the coverage it provides for long-term care. Medicaid will pay for the cost of long-term care, but you must qualify by meeting strict income and asset eligibility requirements. Long-term care insurance could be a solution. Long-term care insurance can be a very smart way to address the challenges from a long-term care need. Long-term care insurance can help pay for nursing home care, as well as, a variety of home and community based care services. Long-term care insurance may not be for everybody, so if you are considering a policy, read it carefully and be sure to work with an insurance agent who understands long-term care issues. With long life comes long-term planning. Make a plan for you and your family today. For more information on long-term care insurance, please contact Mary L. Stockton, Agent, Stockton Financial and Insurance Services, 858-623-8945.